The County Council has recently begun its consultation on its preferred options for housing, employment, and the green belt in the proposed Core Strategy. All parish councils will be submitting responses, but individual residents are encouraged to submit their views too. Core Strategy Preferred Options for Housing, Employment and Green Belt". The "Brief Guide to the Core Strategy Preferred Options Stage 2 consultation - October 2013.pdf" explains the process. It is all a bit daunting to wade through, especially the supporting documents that outline the statistical methodolody and underlying assumptions on which all the growth forecasts are based. However, I encourage everyone to at least tackle the Core Strategy Preferred Options Stage 2 Consultation Document October 2013.pdf document and give their views on as many of the questions as possible. In that document you will find proposals for significant housing development and changes to the county's green belt. It is right, in my opinion, to review green belt provision to see if it is still meeting the needs for which it was originally established. However, I do have concerns over the planned changes and the rationale behind them. The documentation outlines several population growth forecasts which suggest we can expect, approximately, a 4%–6% increase in population. However, the preferred options document is basing its planned housing development on growth of nearer 12.3% for Central Northumberland which is the 'Delivery Area' in which Stocksfield is located. This is based on, it seems, a model that a large increase in housing supply will lead to a net increase in employment (beyond the jobs involved in house building). For details see the section titled "Growing the labour force - building more new homes" starting on page 35. The document EB03 - Population and Household Forecasts - Small area level - Published May 2013.pdf explains how the preferred growth forecasts were arrived at. ￼￼￼￼￼￼￼￼￼8.21 The boundaries of these settlements will be reviewed as part of the preparation of the Delivery Document. This work will be undertaken using the same methodology that was used to identify the land to be removed from the Green Belt in Main Towns and Service Centres. The approach to the treatment of other Green Belt settlements below Service Centre level, including those that fall within the extension around Morpeth, will also be reviewed as part of the Northumberland Delivery Document. The thing to observe here is that the proposed green belt deletions in Hexham and Prudhoe described elsewhere in the document are only part of the story and that further deletions could also be proposed in the villages listed above. There is lots more to say, but the above provides a good starting point. I encourage everyone to take a look at the Core Strategy Preferred Options Stage 2 Consultation Document October 2013.pdf document and send in responses to as many of the 47 questions therein as possible. Note, that many of the questions relate to other parts of the county, so you might want to focus on those dealing with the Central Delivery Area which includes Prudhoe, Stocksfield, Hexham, etc. Specifically, these are Questions 4, 7, 8, 9, 10–18, 21, 31, 33, 34, & 36. 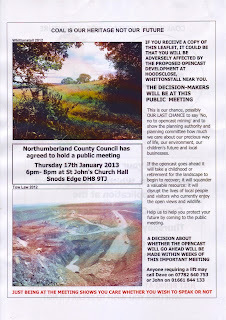 Write to Spatial Policy and Delivery Team, Northumberland County Council, Countil Hall, Morpeth, NE61 2EF. In the last post I raised two questions that people might have at this point: what is a cabinet? and what will fibre to the cabinet mean to me? Stocksfield is served by the telephone exchange next to the Branch End play area. 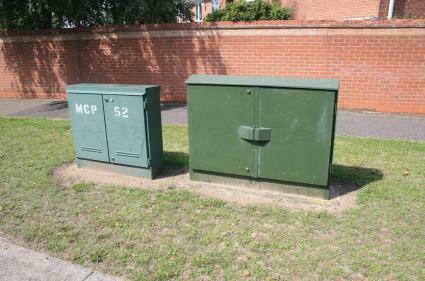 Rather than run copper wires direct from the exchange to every premises, instead a number of roadside cabinets are installed around the exchange area. Each cabinet is connected back to the exchange and individual lines are then run from the cabinet to the premises it serves. This means that the length of the wire that comes into your house is as short as it can be. The problem with the old-fashioned copper wire that our telephone lines work over is that it was never designed for high speed digital broadband. The broadband speed you get is proportional to how far you are from the cabinet. What will Fibre to the Cabinet Mean to Me? When superfast broadband comes to Stocksfield the new fibre-optic cabling will go to the Branch End exchange first. From there more fibre optic cables will connect the exchange to all the cabinets. It is this fibre optic cable that does all the superfast broadband magic. Fibre optic cables are able to carry much more data and at much faster speeds than old fashioned copper wire. That means that every cabinet will be connected to the telephone network at the new superfast speeds. Finally, your house will be connected to the cabinet with copper wire. Because the cabinet is now running at superfast speeds the copper wire to your house will still be able to pass on a lot of the extra speed. The question is, how much? In ideal conditions it is reckoned that the new superfast broadband service will be delivering speeds of up to around 25 or 30 Mbps (mega bits per second). Contrast this with the current up to 8 Mpbs service we currently get. The speed you eventually get will come down to how fast you are from the cabinet to which you are connected. If you're very close you'll get somewhere near the top of the speed range, if you're farther away you will get a slower service. However, whatever speed it is, it should be faster than you currently get. In the next post we will look at estimating where your cabinet is. Well, it's been quite a while since I last posted on this topic. Back in July following a meeting I had up at County Hall I was told that we would be getting the detailed plans for BT's superfast broadband rollout. This information would have enabled us to identify the premises in Stocksfield earmarked for the upgrade and those which were not. I had hoped to present a summary of this information at September's Stocksfield Festival but, unfortunately, even now in November I have still not had sight of BT's plans for our area. Since then a map has been published which I have reproduced in miniature below. You can see the full size version at http://www.inorthumberland.org.uk/wp-content/themes/inorth/img/map.png. However, even when viewed at maximum size there is insufficient detail to be able to see what parts of Stocksfield and its environs will be getting what. The best I can say at this stage is that it looks like a decent chunk of the Stocksfield exchange area will be getting the superfast broadband by the end of 2014 (and possibly by mid-year), but that's about as much as we can say. The other information I do know is that the broadband solution we will be getting is fibre to the cabinet (abbreviated to FTTC ). The alternative to this would have been fibre to the premises (FTTP) but as this would involve running fibre optic cables past every house it was unlikely to be cost effective in our area. There are two questions people might have about this: what is a cabinet? and what will fibre to the cabinet mean to me? I'll deal with these questions in the next post. On Wednesday I went to County Hall in Morpeth for a meeting with the County Council's chief executive, Steve Stewart, and our MP, Guy Opperman to discuss how plans for superfast broadband are going across Northumberland. In previous updates I have stated that we expect only 75% of the Stocksfield exchange area to benefit from the superfast fibre that will be laid by BT over the next couple of years. On Wednesday I learnt that we will soon (in the next couple of weeks) be getting sight of BT's actual rollout plans which means we will be able to see just what proportion of the Stocksfield are will be getting the fibre broadband and which homes and businesses will need an alternative solution. This will give us a much better idea of where we need to focus our efforts over the coming months. As soon as I get the information I will look at ways of sharing it as widely as possible. I have arranged a stall at the Stocksfield Festival where representatives from the Northumberland Community Development Network and iNorthumberland will be joining me to let people know about the services available to local people and businesses to help them make the most of the superfast broadband revolution. I aim to be able to show the planned BT fibre provision there too. More information on that nearer the time. This evening I joined around 20 or so residents in the council chamber in Hexham to witness the planning committee make a decision about the New Ridley application. Very good objections were made by Janice Wilkinson on behalf of the community and Cllr Anne Dale on behalf of the Parish Council. The applicant made a presentation in favour of the development, but it was not very convincing. Cllr Tony Reid from Prudhoe made the most interesting contribution to the debate when he announced that he came to the meeting expecting to support the application but after he saw the details felt that it would be inappropriate. You can imagine the relief in the room when, despite the planning officer's initial recommendation of conditional approval, the planning committee voted unanimously to reject the application. Of course, we must wait to see what the developers will do next. On their way out they were overheard saying they would wait six months and put in another application. We'll cross that bridge when we come to it. This evening is for celebrations. I joined a few locals in the Dr Syntax afterwards for a small glass of bubbly. Plaudits go to all who wrote letters of objection, signed the petition, posed for photographs, turned up to the public meetings, fed in material to inform Janice's speech, who attended this evening's meeting, and who provided moral support all the way through. In the next week or so copies of NE43 news should be dropping onto Stocksfield door mats. In it you will find a leaflet about superfast fibreoptic broadband which will be coming to Stocksfield as part of the major upgrade of Northumberland's broadband infrastructure. Because it is probable that a significant number of properties in our area (up to 25%) will not be covered by the upgrade it is vital that we get a sense of the likely demand for superfast broadband. This is because if we can demonstrate high demand then iNorthumberland will be in a strong position to secure funding for alternative broadband solutions. Therefore, when you get the information leaflet PLEASE register your interest in having faster broadband. The more people who indicate interest, the more leverage we will have in ensuring that everybody in the Stocksfield area has access to the next generation of broadband technology. The leaflet outlines some of the benefits of superfast broadband compared with what we have now. If you're concerned that faster broadband means more scope for online danger for you or your children, then fear not as I am working with iNorthumberland to find ways to raise awareness for residents of how to stay safe online. The information leaflet has a tear off slip which you can drop in the collection box in Boots at Branch End (just on the right as you go in), or at the Parish Office at SICA. If you do not want to wait for the leaflet or prefer to register your interest online then you can do so on iNorthumberland's Stocksfield web page. Be assured that registering interest in superfast broadband does not commit you in any way to purchasing a contract when it becomes available or to signing up with a particular supplier. This exercise is about gauging likely demand. Tomorrow (15 June) sees this year's summer fair at Broomley First School. Two of our children have attended the school and we have been extremely pleased with the experience. Our youngest, Zachary, is just coming to the end of Year 4 so, for us, we're coming to the end of a ten-year era (our middle child, Carys, started at the pre-school in 2003). Shameless plug: Zachary will be manning the Hook a Duck stall for the first hour and I'm sure he will be delighted to relieve us of some of our small change! The summer fair runs from 11am to 1pm, so if you're free, please pop down and hook a duck and take your chances on the other games. Also buy a cake and a cup of tea, a raffle or tombola ticket, or something from one of the many other stalls and support this excellent local school. Ideally, buy something at every stall!! I know my previous post on this subject was subtitled 'Final Thoughts' but, just as many movie franchises manage to find another sequel just when you thought the series was finished, so too there remains more to say about the proposed development in New Ridley. We are still awaiting the outcome of the planning application, though this could be imminent if the committee date of 19 June indicated on the NCC web site is correct. EDIT 12 JUNE: it seems that the application will NOT be going to the planning committee on 19 June. I was very interested to see that the Environment Agency have recommended the application be rejected on the basis that the flood risk assessment (FRA) does not comply with the requirements of the National Planning Policy Framework (NPPF). There were several deficiencies in the FRA highlighted by the Environment Agency and you can read their full representation on the Consultee Comments section of the application. Also on the Consultee Comments section is the response from Northumbria Water. Unfortunately, there seems to be no way to read the representations made by the Broomley and Stocksfield Parish Council or the individual letters sent in by members of the public. There is one public comment that has been submitted via the web site (see here), so it is important that all the representations made by letter are also taken into account by the planning committee. I have asked NCC to clarify the position of these representations and I'll post any replies here. I have just returned from a very good meeting organised and run by the Parish Council to update residents on the New Ridley plans. The Parish Council will be submitting a very strong statement of objection to the plans, listing several major planning criteria that the application clearly fails to meet. If you haven't already done so, please write a letter of objection (see here for relevant dates, address, and sample text). Even if you don't live in New Ridley itself and think that it won't affect you in Stocksfield, Mickley, or Riding Mill, consider this: the New Ridley application proposes to develop green belt land. If this application gets approval then it is likely that further applications will follow. The first would probably be to extend the New Ridley development to the original planned 55 dwellings. But if that doesn't seem bad enough, the second consequence could be proposals to build on the fields opposite Broomley First School. Those fields are extensive and could potentially accommodate hundreds of houses. It causes me great concern to think of the impact that would have, not only on Stocksfield immediately, but also on the surrounding villages of Mickley and Riding Mill in terms of the increased traffic volumes on the A695. This road, which runs through the heart of all three settlements is already very busy, and large scale development would only make the situation worse. I hope the planners will reject this application on the grounds that it demonstrably fails to conform to existing major planning policies. The more objections that individual residents can send, the stronger the message the planning officers will have. Stop this development a) because it is simply a bad opportunistic proposal and b) to stop even worse developments down the line. Please, get writing and get your objection lodged. On 4 March the planning application for the proposed development at New Ridley went public (you can view the planning application and comment on it online here). There will be a public meeting at SICA (the Stocksfield community centre) starting at 7.30 p.m. on 20 March. Recall that this is a large development (22 houses in a village of 55 dwellings) in a location with no amenities. I shall be writing a letter of objection which I will post up here. First, the deadline is tight and your letters need to be submitted by 5 April (following advertisement in last week's Hexham Courant) 25th March (not 16 March as the original notifications advised). Second, if you are objecting to the plans, please make sure you state clearly on your letter that it is a letter of objection otherwise it may just be recorded as a representation only. UPDATE: Here is the text of a letter of objection I have sent to the County Council. There sure is a lot of proposed development in the pipeline for ours and surrounding areas. First there's the opencast mine over in Whittonstall. Within our immediate area are the proposals for 22 houses in New Ridley and the Parish-council led plan to build some affordable housing in Stocksfield which is linked to the Parish plan. Most planned developments raise issues and, invariably, objections. 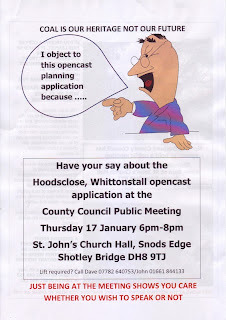 Judging by the mood of the meeting in Snod's Edge in January there is very strong feeling against the opencast mine, and not just amongst the residents of Whittonstall who will feel the immediate impact. Likewise, there is a groundswell of objection (and some incredulity) surrounding the plans to increase the size of New Ridley. However, when it comes to the Parish Council's plans, feelings are not so one-sided. Indeed the proposal has attracted quite a lot of local support, not least because it has come from within the community rather than being dropped on us from a speculative developer from outside the areas. But there are also some who feel very strongly that the development should not go ahead. Various reasons for opposing the plan have been suggested to me from the effect on local wildlife (especially the otters) to concerns that the new buildings might have an adverse effect on the Guessburn's ability to flood when necessary leading to possible damaging erosion of its banks. At the moment I am interested to hear people's views on this proposal. Please feel free to comment below either on the Guessburn development or on the other plans mentioned above. If you'd prefer to get in touch another way please see how on the Contacts page. Back in October I wrote a few words about the proposed development of a coal mine near Whittonstall. 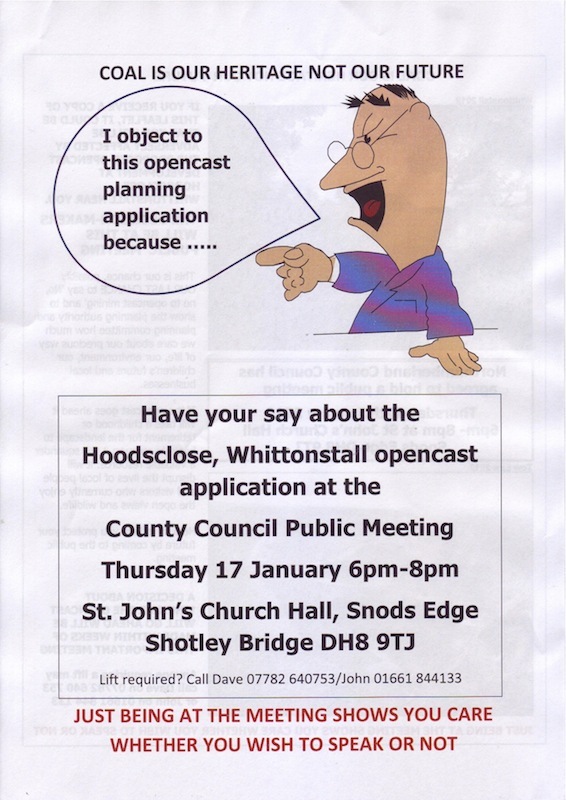 Northumberland County Council has agreed to hold a public meeting about the proposal on Thursday 17th January from 6pm-8pm at St. John's Church Hall, Snod's Edge. As you can see from the flier below, this is your last chance to register opposition to the project. A planning decision will follow within a few weeks. 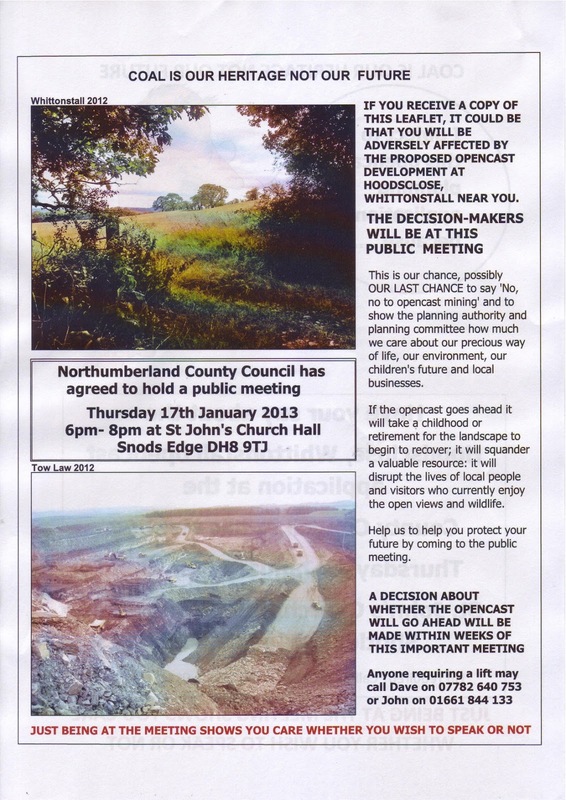 If you live in Stocksfield, Mickley, or the surrounding settlements of Kipperlynn, Apperley, Hindley, Broomley and Wheelbirks then you really should make every attempt to attend this meeting as the mining operation could have an adverse effect on where you live. Even if you don't want to say anything at the meeting, just being there will show support.